The precession of the equinoxes refers to the precession of Earth's axis of rotation with respect to inertial space. 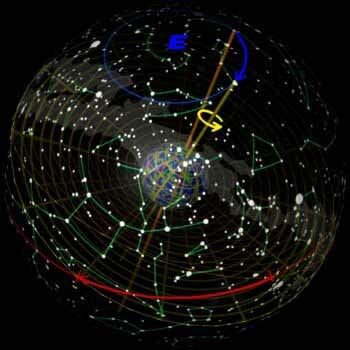 Hipparchus discovered that the positions of the equinoxes move westward along the ecliptic compared to the fixed stars on the celestial sphere. The exact dates of his life are not known, but astronomical observations attributed to him date from 147 BC to 127 BC and were described in his publications. He is considered the greatest astronomical observer, and perhaps, the greatest overall astronomer of antiquity. Currently, this annual motion is about 50.3 seconds of arc per year or 1 degree every 71.6 years. The process is slow, but cumulative. 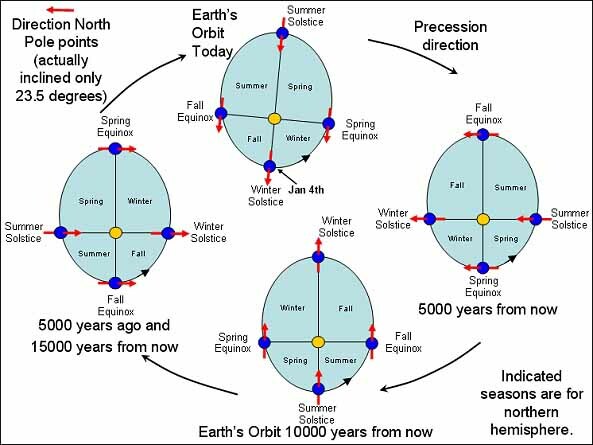 A complete precession cycle covers a period of approximately 25,765 years, the so called great Platonic year, during which time the equinox regresses over a full 360°. Precessional movement also is the determining factor in the length of an Astrological Age. A consequence of the precession is a changing pole star. Currently Polaris is extremely well-suited to mark the position of the north celestial pole, as it is about a half degree away from it and it is a moderately bright star (visual magnitude is 2.1 (variable)). 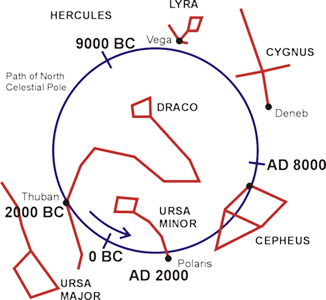 On the other hand Thuban in the constellation Draco, which was the pole star in 3000 BC is much less conspicious at magnitude 3.67 (one-fifth as bright as Polaris); today it is all but invisible in light-polluted urban skies. The brilliant Vega in the constellation Lyra is often touted as the best Northstar, when it fulfilled that role around 12000 BC and will do so again around the year AD 14000. In reality it never comes closer than 5° to the pole. When Polaris will be the north star again around 27800 AD, due to its proper motion it will be farther away from the pole then than it is now, while in 23600 BC it came closer to the pole. To find the south celestial pole in the sky at this moment, one is less lucky, as that area is a particularly bland portion of the sky, and the nominal south pole star is Sigma Octantis, which with magnitude 5.5 is barely visible even under a properly dark sky. However that will change in the 80th to 90th century, when the south celestial pole travels through the False cross. It is also seen from the starmap that the south pole, nicely pointed to by the Southern cross for the last 2000 years or so, is moving towards that constellation. By consequence it is now no longer visible from subtropical northern latitudes as it was in the time of the ancient Greeks. Still pictures like these, found in many astronomy books, are only first approximations as they do not take into account the variable speed of the precession, the variable obliquity of the ecliptic, the planetary precession (which makes not the ecliptic pole the centre, but a circle about 6° away from it) and the proper motions of the stars. Precessional movement as seen from 'outside' the celestial sphere. The rotation axis of the Earth describes over a period of about 25800 years a small circle (blue) among the stars, centred around the ecliptic northpole (blue E) and with an angular radius of about 23.4°: the angle known as the obliquity of the ecliptic. The orange axis was the Earth's rotation axis 5000 years ago when it pointed to the star Thuban. The yellow axis, pointing to Polaris is the situation now. Note that when the celestial sphere is seen from outside constellations appear in mirror image. Also note that the daily rotation of the Earth around its axis is opposite to the precessional rotation. When the polar axis precesses from one direction to another, then the equatorial plane of the Earth (indicated with the circular grid around the equator) and the associated celestial equator will move too. Where the celestial equator intersects the ecliptic (red line) there are the equinoxes. As seen from the drawing, the orange grid, 5000 years ago one intersection of equator and ecliptic, the vernal equinox was close to the star Aldebaran of Taurus. By now (the yellow grid) it has shifted (red arrow) to somewhere in the constellation of Pisces. Note that this is an astronomical description of the precessional movement and the vernal equinox position in a given constellation may not imply the astrological meaning of an Age carrying the same name, as they (ages and constellations) only have an exact alignment in the "first point of Aries", meaning once in each ca. 25800 (Great Sidereal Year). It might not be directly clear to the non-astronomer what the shift of the equinoxes has to do with the precession of the rotation axis of the Earth. The figures to the right try to explain that. The rotation axis of the Earth describes over a period of 25700 years a small circle (blue) among the stars, centred around the ecliptic northpole (blue E) and with an angular radius of about 23.4°: the angle known as the obliquity of the ecliptic. The orange axis was the Earth's rotation axis 5000 years ago when it pointed to the star Thuban. The yellow axis, pointing to Polaris is the situation now. Note that when the celestial sphere is seen from outside (as in the first drawing, an impossibilty of course) constellations appear in mirror image. Also note that the daily rotation of the Earth around its axis is opposite to the precessional rotation. Of course when the polar axis precesses from one direction to another, then the equatorial plane of the Earth (indicated with the circular grid around the equator) and the associated celestial equator will move too. Where the celestial equator intersects the ecliptic (red line) there are the equinoxes. As seen from the drawing, the orange grid, 5000 years ago one intersection of equator and ecliptic, the vernal equinox was close to the star Aldebaran of Taurus. By now (the yellow grid) it has shifted (red arrow) to somewhere in the constellation of Pisces. This is why the equinoctial shift is a consequence of the precession of the rotation axis of the Earth and the other way around. The second drawing shows the perspective from a near Earth position as seen through a very wide angle lens (from which the apparent distortion). The precession as a consequence of the torque exerted on Earth by differential gravitation. The precession of the equinoxes is caused by the differential gravitation forces of Sun and Moon on Earth. In popular science books one often finds this explained with the analogy of the precession of a spinning top. Indeed it is the same physical effect, however, some crucial details differ. In a spinning top it is gravity which causes the top to wobble which in its turn causes precession. The applied force is thus in the first instance parallel to the rotation axis. But for the Earth the applied forces of the Sun and Moon are in the first instance perpendicular to it. So how then can they cause it? The answer is that the forces do not work on the rotation axis. Instead they work on the equatorial bulge; due to its own rotation, the Earth is not a perfect sphere but an oblate spheroid, the equatorial diameter about 43 km larger than the polar. If the Earth were a perfect sphere, there would be no precession. The figure explains how this works. The Earth is given as a perfect sphere (so that all gravitational forces working on it can be taken equal as one force working on its center), and the bulge is approximated to be a torus of mass (blue) around its equator. Green arrows indicate the gravitational forces from the Sun on some extreme points. These forces are not parallel as they all point towards the centre of the Sun. Therefore the forces working on the northernmost and southernmost parts of the equatorial bulge have a component perpendicular on the ecliptical plane and directed towards it. We find them (small cyan arrows) when the average gravitation force on the centre of the Earth is substracted (because this force will be used as the centripetal force for the Earth in its orbit around the Sun). In all cases in addition to these tangential components there will be also radial components, but they are not shown as they do not contribute to the precession (they contribute to the tides). It is now clear how these tangential forces create a torque (orange), and this torque added to the rotation (magenta) shifts the rotation axis slightly to a new position (yellow). Repeat this again and again, and one sees how the axis precesses along the white circle, which is centred around the ecliptic pole. 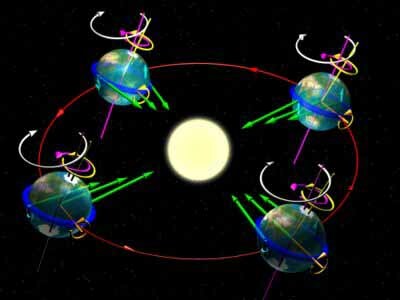 It is important to note that the torque is always in the same direction, perpendicular onto the direction in which the rotation axis is tilted away from the ecliptic pole, so that it does not change the axial tilt itself. It is also important to note that the torque is everywhere the same, whatever position of the Earth is in its orbit around the Sun. The precession is thus always steadily progressing and does not change with the seasons. Although the above explanation involved the Sun, the same story holds true for any object moving around the Earth along (or close to) the ecliptic, i.e. the Moon. The combined action of the Sun and the Moon is called the lunisolar precession. In addition to the steady progressive motion (resulting in a full circle in 25700 years) the Sun and Moon also cause small periodic variations, due to their changing positions. These oscillations, in both precessional speed and axial tilt are known as the nutation. Did you know youre loved by somebody? 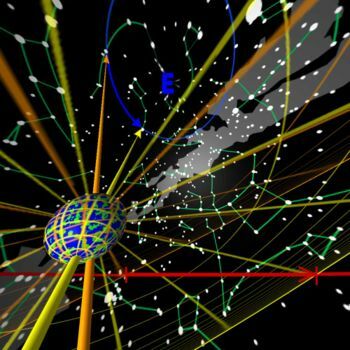 The most important term has a period of 18.6 years and an amplitude of less than 20 arcseconds. In addition to lunisolar precession, the actions of the other planets of the solar system cause the whole ecliptic to slowly rotate around an axis which has an ecliptic longitude of about 174° measured on the instantaneous ecliptic. This planetary precession shift is only 0.47 arcseconds per year (more than a hundred times smaller than lunisolar precession), and takes place along the instantaneous equator. The sum of the two precessions is known as the general precession. This figure illustrates the effects of axial precession on the seasons, relative to perihelion and aphelion. The precession of the equinoxes can cause periodic climate change (see Milankovitch cycles), because the hemisphere that experiences summer at perihelion and winter at aphelion (as the southern hemisphere does presently) is in principle prone to more severe seasons than the opposite hemisphere. Hipparchus estimated Earth's precession around 130 BC, adding his own observations to those of Babylonian and Chaldean astronomers in the preceding centuries. In particular they measured the distance of the stars like Spica to the Moon and Sun at the time of lunar eclipses, and because he could compute the distance of the Moon and Sun from the equinox at these moments, he noticed that Spica and other stars appeared to have moved over the centuries. Precession causes the cycle of seasons (tropical year) to be about 20.4 minutes less than the period for the earth to return to the same position with respect to the stars as one year previously (sidereal year). This results in a slow change (one day per 71 calendar years) in the position of the sun with respect to the stars at an equinox. It is significant for calendars and their leap year rules. We allegedly are in the Age of Aquarius. According to astrological mysticism, there will be unusual harmony and understanding in the world. Those who follow that belief system see it as a turning point in human consciousness in which balance is restored by consciously moving beyond the physical body. The Age of Aquarius is the polar opposite of the Age of Leo - in the bipolar reality in which we experience the physical experiment of time and illusion through the consciousness projection of the eye or All Seeing Eye. In a book called On the Revolutions of the Heavenly Bodies (that was published as Copernicus lay on his deathbed), Copernicus proposed that the Sun, not the Earth, was the center of the Solar System. Such a model is called a heliocentric system. The ordering of the planets known to Copernicus in this new system is illustrated in the following figure, which we recognize as the modern ordering of those planets. In this new ordering the Earth is just another planet (the third outward from the Sun), and the Moon is in orbit around the Earth, not the Sun. The stars are distant objects that do not revolve around the Sun. Instead, the Earth is assumed to rotate once in 24 hours, causing the stars to appear to revolve around the Earth in the opposite direction. Avoda Zara (3b): "Rav Yehuda says, there are twelve hours in a day. The first three hours God sits and learns the Torah, the second three hours he sits and judges the world. The third three hours God feeds the entire world... the fourth three hour period God plays with the Leviathan as it is written: "the Leviathan which you have created to play with"". The planets in such a system naturally vary in brightness because they are not always the same distance from the Earth. The retrograde motion could be explained in terms of geometry and a faster motion for planets with smaller orbits, as illustrated in the following animation. A similar construction can be made to illustrate retrograde motion for a planet inside the orbit of the Earth. There is a common misconception that the Copernican model did away with the need for epicycles. This is not true, because Copernicus was able to rid himself of the long-held notion that the Earth was the center of the Solar system, but he did not question the assumption of uniform circular motion. than the Ptolemaic system because it moved the Sun to the center. (3) the assumption that objects in the heavens were made from a perfect, unchanging substance not found on the Earth. that the objects in the sky were made of special unchanging stuff. Since the Earth is just another planet, there will eventually be a natural progression to the idea that the planets are made from the same stuff that we find on the Earth. Copernicus was an unlikely revolutionary. It is believed by many that his book was only published at the end of his life because he feared ridicule and disfavor: by his peers and by the Church, which had elevated the ideas of Aristotle to the level of religious dogma. However, this reluctant revolutionary set in motion a chain of events that would eventually (long after his lifetime) produce the greatest revolution in thinking that Western civilization has seen. His ideas remained rather obscure for about 100 years after his death. But, in the 17th century the work of Kepler, Galileo, and Newton would build on the heliocentric Universe of Copernicus and produce the revolution that would sweep away completely the ideas of Aristotle and replace them with the modern view of astronomy and natural science. This sequence is commonly called the Copernican Revolution. If the Earth actually spun on an axis (as required in a heliocentric system to explain the diurnal motion of the sky), why didn't objects fly off the spinning Earth? If the Earth was in motion around the sun, why didn't it leave behind the birds flying in the air? If the Earth were actually on an orbit around the sun, why wasn't a parallax effect observed? That is, as illustrated in the adjacent figure, stars should appear to change their position with the respect to the other background stars as the Earth moved out of its orbit, because of viewing them from a different perspective (just as viewing an object first with one eye, and then the other, causes the apparent position of the object to change with respect to the background). The first two objections were not valid because they represent an inadequate understanding of the physics of motion that would only be corrected in the 17th century. The third objection is valid, but failed to account for what we now know to be the enormous distances to the stars. As illustrated in the following figure, the amount of parallax decreases with distance. The parallax effect is there, but it is very small because the stars are so far away that their parallax can only be observed with very precise instruments. Indeed, the parallax of stars was not measured conclusively until the year 1838. Thus, the heliocentric idea of Aristarchus was quickly forgotten and Western thought stagnated for almost 2000 years as it waited for Copernicus to revive the heliocentric theory. He made the most precise observations that had yet been made by devising the best instruments available before the invention of the telescope. His observations of planetary motion, particularly that of Mars, provided the crucial data for later astronomers like Kepler to construct our present model of the solar system. He made observations of a supernova (literally: nova= "new star") in 1572 (we now know that a supernova is an exploding star, not a new star). This was a "star" that appeared suddenly where none had been seen before, and was visible for about 18 months before fading from view. Since this clearly represented a change in the sky, prevailing opinion held that the supernova was not really a star but some local phenomenon in the atmosphere (remember: the heavens were supposed to be unchanging in the Aristotelian view). Brahe's meticulous observations showed that the supernova did not change positions with respect to the other stars (no parallax). Therefore, it was a real star, not a local object. This was early evidence against the immutable nature of the heavens, although Brahe did not interpret the absence of parallax for stars correctly, as we discuss below. Brahe made careful observations of a comet in 1577. By measuring the parallax for the comet, he was able to show that the comet was further away than the Moon. This contradicted the teachings of Aristotle, who had held that comets were atmospheric phenomena ("gases burning in the atmosphere" was a common explanation among Aristotelians). As for the case of the supernova, comets represented an obvious change in a celestial sphere that was supposed to be unchanging; furthermore, it was very difficult to ascribe uniform circular motion to a comet. the stars were so far away that their parallax was too small to measure. Not for the only time in human thought, a great thinker formulated a pivotal question correctly, but then made the wrong choice of possible answers: Brahe did not believe that the stars could possibly be so far away and so concluded that the Earth was the center of the Universe and that Copernicus was wrong. Brahe proposed a model of the Solar System that was intermediate between the Ptolemaic and Copernican models (it had the Earth at the center). It proved to be incorrect, but was the most widely accepted model of the Solar System for a time. Thus, Brahe's ideas about his data were not always correct, but the quality of the observations themselves was central to the development of modern astronomy. Kepler's second law is illustrated in the preceding figure. The line joining the Sun and planet sweeps out equal areas in equal times, so the planet moves faster when it is nearer the Sun. Thus, a planet executes elliptical motion with constantly changing angular speed as it moves about its orbit. The point of nearest approach of the planet to the Sun is termed perihelion; the point of greatest separation is termed aphelion. Hence, by Kepler's second law, the planet moves fastest when it is near perihelion and slowest when it is near aphelion. In this equation P represents the period of revolution for a planet and R represents the length of its semimajor axis. The subscripts "1" and "2" distinguish quantities for planet 1 and 2 respectively. The periods for the two planets are assumed to be in the same time units and the lengths of the semimajor axes for the two planets are assumed to be in the same distance units. Kepler's Third Law implies that the period for a planet to orbit the Sun increases rapidly with the radius of its orbit. Thus, we find that Mercury, the innermost planet, takes only 88 days to orbit the Sun but the outermost planet (Pluto) requires 248 years to do the same. Xenon (pronounced /ˈzɛnɒn/ or /'ziːnɒn/) is the chemical element that has the symbol Xe and atomic number 54. A colorless, heavy, odorless noble gas, xenon occurs in the earth's atmosphere in trace amounts. Although generally unreactive, xenon can undergo a few chemical reactions such as the formation of xenon hexafluoroplatinate, the first noble gas compound to be synthesized. Naturally occurring xenon consists of nine stable isotopes. There are also over 40 unstable isotopes that undergo radioactive decay. The isotope ratios of xenon are an important tool for studying the early history of the Solar System. Xenon-135 is produced as a result of nuclear fission and acts as a neutron absorber in nuclear reactors. Xenon is used in flash lamps and arc lamps, and as a general anesthetic. The first excimer laser design used a xenon dimer molecule (Xe2) as its lasing medium, and the earliest laser designs used xenon flash lamps as pumps. Xenon is also being used to search for hypothetical weakly interacting massive particles and as the propellant for ion thrusters in spacecraft. Xenon was discovered in England by William Ramsay and Morris Travers on July 12, 1898, shortly after their discovery of the elements krypton and neon. They found it in the residue left over from evaporating components of liquid air. Ramsay suggested the name xenon for this gas from the Greek word ξένον [xenon], neuter singular form of ξένος [xenos], meaning 'foreign(er)', 'strange(r)', or 'guest'. In 1902, Ramsay estimated the proportion of xenon in the Earth's atmosphere as one part in 20 million. During the 1930s, engineer Harold Edgerton began exploring strobe light technology for high speed photography. This led him to the invention of the xenon flash lamp, in which light is generated by sending a brief electrical current through a tube filled with xenon gas. In 1934, Edgerton was able to generate flashes as brief as one microsecond with this method. In 1939 Albert R. Behnke Jr. began exploring the causes of "drunkenness" in deep-sea divers. He tested the effects of varying the breathing mixtures on his subjects, and discovered that this caused the divers to perceive a change in depth. From his results, he deduced that xenon gas could serve as an anesthetic. Although Lazharev, in Russia, apparently studied xenon anesthesia in 1941, the first published report confirming xenon anesthesia was in 1946 by J. H. Lawrence, who experimented on mice. Xenon was first used as a surgical anesthetic in 1951 by Stuart C. Cullen, who successfully operated on two patients. Xenon and the other noble gases were for a long time considered to be completely chemically inert and not able to form compounds. However, while teaching at the University of British Columbia, Neil Bartlett discovered that the gas platinum hexafluoride (PtF6) was a powerful oxidizing agent that could oxidize oxygen gas (O2) to form dioxygenyl hexafluoroplatinate (O2+[PtF6]−). Since O2 and xenon have almost the same first ionization potential, Bartlett realized that platinum hexafluoride might also be able to oxidize xenon. On March 23, 1962, he mixed the two gases and produced the first known compound of a noble gas, xenon hexafluoroplatinate. Bartlett thought its composition to be Xe+[PtF6]−, although later work has revealed that it was probably a mixture of various xenon-containing salts. Since then, many other xenon compounds have been discovered, and some compounds of the noble gases argon, krypton, and radon have been identified, including argon fluorohydride (HArF), krypton difluoride (KrF2), and radon fluoride. Xenon is a trace gas in Earth's atmosphere, occurring at 0.087±0.001 parts per million (μL/L), and is also found in gases emitted from some mineral springs. Some radioactive species of xenon, for example, 133Xe and 135Xe, are produced by neutron irradiation of fissionable material within nuclear reactors. Xenon is obtained commercially as a byproduct of the separation of air into oxygen and nitrogen. After this separation, generally performed by fractional distillation in a double-column plant, the liquid oxygen produced will contain small quantities of krypton and xenon. By additional fractional distillation steps, the liquid oxygen may be enriched to contain 0.1–0.2% of a krypton/xenon mixture, which is extracted either via adsorption onto silica gel or by distillation. Finally, the krypton/xenon mixture may be separated into krypton and xenon via distillation. Extraction of a liter of xenon from the atmosphere requires 220 watt-hours of energy. Worldwide production of xenon in 1998 was estimated at 5,000–7,000 m3. Due to its low abundance, xenon is much more expensive than the lighter noble gases—approximate prices for the purchase of small quantities in Europe in 1999 were 10 €/L for xenon, 1 €/L for krypton, and 0.20 €/L for neon. Xenon is relatively rare in the Sun's atmosphere, on Earth, and in asteroids and comets. The atmosphere of Mars shows a xenon abundance similar to that of Earth: 0.08 parts per million, however Mars shows a higher proportion of 129Xe than the Earth or the Sun. As this isotope is generated by radioactive decay, the result may indicate that Mars lost most of its primordial atmosphere, possibly within the first 100 million years after the planet was formed. By contrast, the planet Jupiter has an unusually high abundance of xenon in its atmosphere; about 2.6 times as much as the Sun. This high abundance remains unexplained and may have been caused by an early and rapid buildup of planetesimals—small, subplanetary bodies—before the presolar disk began to heat up. (Otherwise, xenon would not have been trapped in the planetesimal ices.) Within the Solar System, the nucleon fraction for all isotopes of xenon is 1.56 × 10-8, or one part in 64 million of the total mass. The problem of the low terrestrial xenon may potentially be explained by covalent bonding of xenon to oxygen within quartz, hence reducing the outgassing of xenon into the atmosphere. Unlike the lower mass noble gases, the normal stellar nucleosynthesis process inside a star does not form xenon. Elements more massive than iron-56 have a net energy cost to produce through fusion, so there is no energy gain for a star to create xenon. Instead, many isotopes of xenon are formed during supernova explosions. Galileo Galilei (1564-1642) was a pivotal figure in the development of modern astronomy, both because of his contributions directly to astronomy, and because of his work in physics and its relation to astronomy. He provided the crucial observations that proved the Copernican hypothesis, and also laid the foundations for a correct understanding of how objects moved on the surface of the earth (dynamics) and of gravity. Newton, who was born the same year that Galileo died, would build on Galileo's ideas to demonstrate that the laws of motion in the heavens and the laws of motion on the earth were one and the same. Thus, Galileo began and Newton completed a synthesis of astronomy and physics in which the former was recognized as but a particular example of the latter, and that would banish the notions of Aristotle almost completely from both. One could, with considerable justification, view Galileo as the father both of modern astronomy and of modern physics. Galileo did not invent the telescope (Dutch spectacle makers receive that credit), but he was the first to use the telescope to study the heavens systematically. His little telescope was poorer than even a cheap modern amateur telescope, but what he observed in the heavens rocked the very foundations of Aristotle's universe and the theological-philosophical worldview that it supported. It is said that what Galileo saw was so disturbing for some officials of the Church that they refused to even look through his telescope; they reasoned that the Devil was capable of making anything appear in the telescope, so it was best not to look through it. Galileo observed the Sun through his telescope and saw that the Sun had dark patches on it that we now call sunspots (he eventually went blind, perhaps from damage suffered by looking at the Sun with his telescope). Furthermore, he observed motion of the sunspots indicating that the Sun was rotating on an axis. These "blemishes" on the Sun were contrary to the doctrine of an unchanging perfect substance in the heavens, and the rotation of the Sun made it less strange that the Earth might rotate on an axis too, as required in the Copernican model. Both represented new facts that were unknown to Aristotle and Ptolemy. Galileo observed 4 points of light that changed their positions with time around the planet Jupiter. He concluded that these were objects in orbit around Jupiter. Indeed, they were the 4 brightest moons of Jupiter, which are now commonly called the Galilean moons (Galileo himself called them the Medicea Siderea---the ``Medician Stars''). Here is an animation based on actual observations of the motion of these moons around Jupiter. These observations again showed that there were new things in the heavens that Aristotle and Ptolemy had known nothing about. Furthermore, they demonstrated that a planet could have moons circling it that would not be left behind as the planet moved around its orbit. One of the arguments against the Copernican system (and the original heliocentric idea of Aristarchus) had been that if the moon were in orbit around the Earth and the Earth in orbit around the Sun, the Earth would leave the Moon behind as it moved around its orbit. Galileo used his telescope to show that Venus went through a complete set of phases, just like the Moon. This observation was among the most important in human history, for it provided the first conclusive observational proof that was consistent with the Copernican system but not the Ptolemaic system. The crucial point is the empirical fact that Venus is never very far from the Sun in our sky (see the earlier discussion of aspects & phases of the inferior planets). Thus, as the following diagrams indicate, in the Ptolemaic system Venus should always be in crescent phase as viewed from the Earth because as it moves around its epicycle it can never be far from the direction of the sun (which lies beyond it), but in the Copernican system Venus should exhibit a complete set of phases over time as viewed from the Earth because it is illuminated from the center of its orbit. It is important to note that this was the first empirical evidence (coming almost a century after Copernicus) that allowed a definitive test of the two models. Until that point, both the Ptolemaic and Copernican models described the available data. The primary attraction of the Copernican system was that it described the data in a simpler fashion, but here finally was conclusive evidence that not only was the Ptolemaic universe more complicated, it also was incorrect. Showing that the planets were disks, not points of light, as seen through the telescope. Showing that the great "cloud" called the Milky Way (which we now know to be the disk of our spiral galaxy) was composed of enormous numbers of stars that had not been seen before. Observing that the planet Saturn had "ears". We now know that Galileo was observing the rings of Saturn, but his telescope was not good enough to show them as more than extensions on either side of the planet. Pluto's atmosphere consists of a thin envelope of nitrogen, methane, and carbon monoxide, derived from the ices on its surface. As Pluto moves away from the Sun, its atmosphere gradually freezes and falls to the ground. As it edges closer to the Sun, the temperature of Pluto's solid surface increases, causing the ices to sublimate into gas. This creates an anti-greenhouse effect; much like sweat cools the body as it evaporates from the surface of the skin, this sublimation has a cooling effect on the surface of Pluto. Showing that the Moon was not smooth, as had been assumed, but was covered by mountains and craters. As each new wonder was observed, increasing doubt was cast on the prevailing notion that there was nothing new to be observed in the heavens because they were made from a perfect, unchanging substance. It also raised the credibility issue: could the authority of Aristotle and Ptolemy be trusted concerning the nature of the Universe if there were so many things in the Universe about which they had been completely unaware? Galileo made extensive contributions to our understanding of the laws governing the motion of objects. The famous Leaning Tower of Pisa experiment may be apocryphal. It is likely that Galileo himself did not drop two objects of very different weight from the tower to prove that (contrary to popular expectations) they would hit the ground at the same time. However, it is certain that Galileo understood the principle involved, and probably did similar experiments. The realization that, as we would say in modern terms, the acceleration due to gravity is independent of the weight of an object was important to the formulation of a theory of gravitation by Newton. Here is an animation of experiments with inclined planes that Galileo probably did to confirm these ideas, and here is a page with some MPEG film clips illustrating the same ideas. Here are additional MPEG filmclips illustrating Galileo's experiments concerning the motion of projectiles in a gravitational field. Perhaps Galileo's greatest contribution to physics was his formulation of the concept of inertia: an object in a state of motion possesses an ``inertia'' that causes it to remain in that state of motion unless an external force acts on it. In order to arrive at this conclusion, which will form the cornerstone of Newton's laws of motion (indeed, it will become Newton's First Law of Motion), Galileo had to abstract from what he, and everyone else, saw. Most objects in a state of motion do NOT remain in that state of motion. For example, a block of wood pushed at constant speed across a table quickly comes to rest when we stop pushing. Thus, Aristotle held that objects at rest remained at rest unless a force acted on them, but that objects in motion did not remain in motion unless a force acted constantly on them. Galileo, by virtue of a series of experiments (many with objects sliding down inclined planes), realized that the analysis of Aristotle was incorrect because it failed to account properly for a hidden force: the frictional force between the surface and the object. Thus, as we push the block of wood across the table, there are two opposing forces that act: the force associated with the push, and a force that is associated with the friction and that acts in the opposite direction. Galileo realized that as the frictional forces were decreased (for example, by placing oil on the table) the object would move further and further before stopping. From this he abstracted a basic form of the law of inertia: if the frictional forces could be reduced to exactly zero (not possible in a realistic experiment, but it can be approximated to high precision) an object pushed at constant speed across a frictionless surface of infinite extent will continue at that speed forever after we stop pushing, unless a new force acts on it at a later time. Galileo's challenge of the Church's authority through his assault on the Aristotelian conception of the Universe eventually got him into deep trouble with the Inquisition. Late in his life he was forced to recant publicly his Copernican views and spent his last years essentially under house arrest. His story certainly constitutes one of the sadder examples of the conflict between the scientific method and "science" based on unquestioned authority. Unfortunately, there still are many forces in modern society that would shackle the scientific method of open enquiry in idealogical chains of one kind or another. This illustration also demonstrates graphically that velocity (and therefore acceleration) is a vector: the direction of the rock's velocity is certainly of critical interest to the person standing under the rock in the two illustrations! Notice that velocity, which is a vector, is changed if either its magnitude or its direction is changed. Thus, acceleration occurs when either the magnitude or direction of the velocity (or both) are altered. In particular, notice from the adjacent image that circular motion (even at uniform angular velocity) implies a continual acceleration, because the direction of the velocity (indicated by the direction of the arrow) is continuously changing, even if its magnitude (indicated by the length of the arrow) is constant. This point, that motion on a curved path is accelerated motion, will prove crucial to our subsequent understanding of motion in gravitational fields. How Many Accelerators Does Your Car Have? Be aware that in popular speech acceleration is assumed to be an increase in the magnitude of the velocity. As we have just seen, acceleration also occurs when the direction of the velocity is changed, even if the magnitude is constant; furthermore, in physics a decrease in the velocity is just as much an acceleration as an increase. Thus, your car actually has at least 3 accelerators: (1) the foot pedal called the "accelerator", that changes the magnitude of the velocity, (2) the brake, which also changes the magnitude of the velocity, and (3) the steering wheel, which changes the direction of the velocity!